Noodles: Wheat Flour, Potato Starch, Salt, Soy Bean Oil (0.242%), Acidity Regulator, Palm Oil. So..
Noodles: Wheat Flour, Potato Starch, Salt, Soy Bean Oil (0.245%), Acidity Regulator, Palm Oil. So..
Noodles: Wheat Flour, Potato Starch, Salt, Soybean Oil (0.24%), Acidity Regulator, Palm Oil. Soup..
Noodles: Wheat Flour, Potato Starch, Salt, Soy Bean Oil (0.236%), Acidity Regulator, Palm Oil. So..
Noodles: Wheat Flour (55%), Palm Oil (Contains E306), Salt, Acidity Regulators (E502, E500), Humecta..
Noodles: Wheat Flour (67%), Palm Oil, Potato Starch, Corn Flour, Salt. Soup Powder: Salt, F..
Noodles: Wheat Flour (62%), Palm Oil, Potato Starch, Salt. 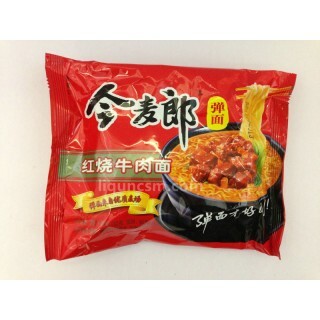 Soup Powder: Salt, Flavour Enhancers (..
Noodle: Wheat Flour (71%), Palm Oil, Potato Starch, Salt. Soup Powder: Salt, Spices (Red Pepper, ..
Noodles: Wheat Flour (65%), Palm Oil, Potato Starch, Salt, Corn Flour. Soup Powder: Salt, Flavour..
Noodles: Wheat Flour (65%), Palm Oil, Potato Starch, Salt. Soup Powder: Salt, Flavour Enhancers (..